Paul Pehrson writes an independent review of MadCap Software’s latest release of Flare, their flagship product. Released early in 2014, Flare V10 boasts several features that just might make you giddy. These days lists seem all the rage, and with Flare coming in with its tenth major version, it seems appropriate to give a list of ten reasons you are going to love Flare 10, ordered by my level of excitement about them. Even if you have never heard of responsive design, you have probably seen it used on many websites including BBC News. It is that feature that makes a website adapt to the size of the browser window. This allows you to style your website for small screens (like phones), medium screens (like tablets), and large screens (like desktop or laptop screens). I won’t go into detail here, since that isn’t the focus of this article, but you should Google ‘responsive design’ to learn more about it. While there is a technical difference between responsive design and adaptive design, I don’t make that distinction in this article. For our purposes, a responsive website is any site that provides different display rules for different device sizes. Now, grab the bottom right corner of your browser window and drag to make it smaller. Notice that at a certain size, the left panel disappears and a menu button appears. This means your mobile and tablet users can now easily use your main site! 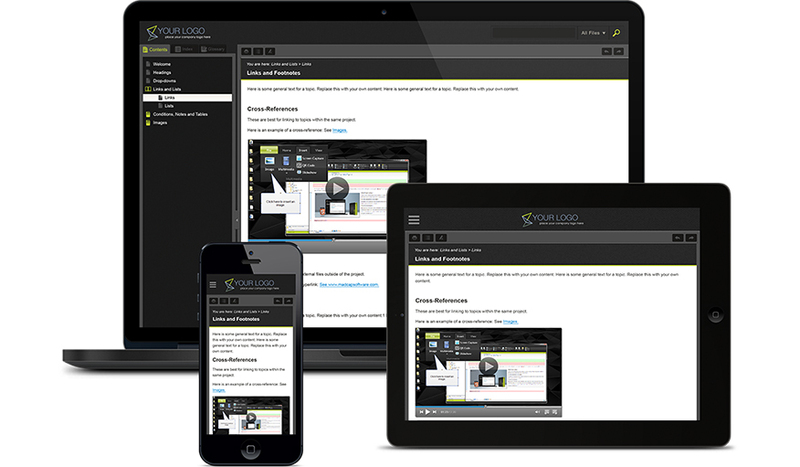 Flare V10 comes with a new HTML5 Skin Editor which makes creating and editing your skins dramatically easier. In previous versions of Flare, the Skin Editor acted a lot like the advanced view of the CSS Editor. Now the Skin Editor groups the style settings better, making changing styles much easier. In addition, there is a built in preview window, so you can see what your changes look like as you are making them. If you use several conditions in your project, you are going to love this new feature. I have worked with clients who create custom versions of their products for each customer. They often have some text or images that are specific to that client, and I managed those with conditions. 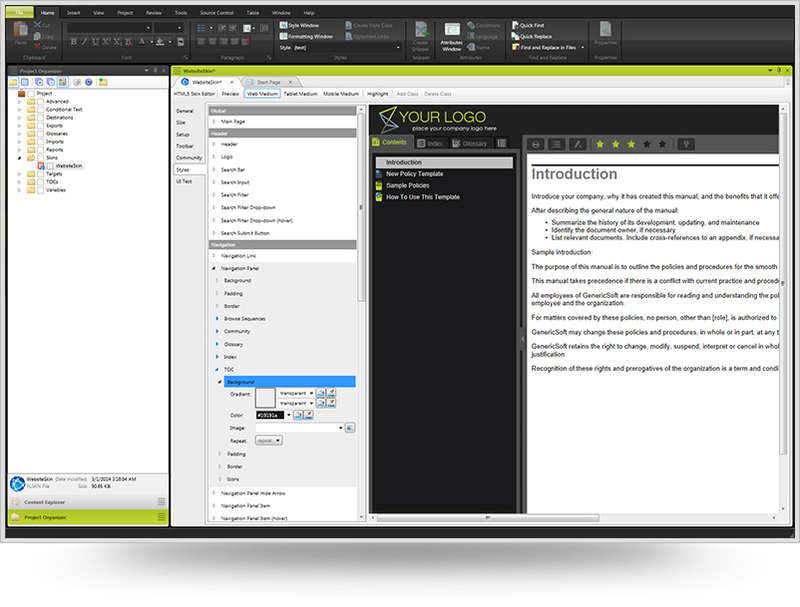 The trouble is that the XML Editor can get cluttered with all those customisations for each client. Sometimes when I’m writing, I just want to see the content that matches a specific condition. Now you can, and it is wonderful. In the past, due to a limitation in the code base upon which Flare is built, Flare did not support most OTF fonts. This meant contacting the foundry for a TrueType version of the font, or substituting the preferred font for a lessthan-perfect substitute. 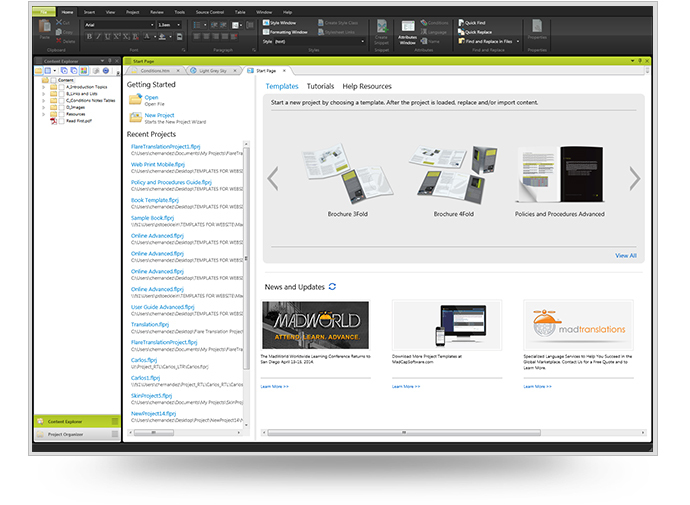 Like the existing .NET output type, Eclipse output is targeted at a specific segment of software developers, but it makes it easy for technical communicators to create help in a plug-in format that is compatible with the Eclipse IDE. This also allows you to publish your content in a single JAR file. Reviews can also have specific target-variable definitions. This means that you can control which variable definition is despatched with a topic that is being sent out for review. Flare V10 includes several new ways for you to customise your content to make sending it much easier. First, you can now create custom lists and re-use those list styles throughout your project. In the past, you had to create the settings for each level of list manually in the style sheet. Now, in the XML Editor you can customise your lists and their sub-lists without ever opening the style sheet. Frame breaks for printed output make sure you move from one frame to the next frame on the page. This means you can ensure your H1 headings stay in a specific frame and content automatically starts in the main content frame on that printed page. Several features from the evolving CSS3 specification are now supported in the CSS Editor and outputs, including rounded corners and before/after pseudo classes. To be fair, you could do this manually in previous versions of Flare, but you had to add the code manually in the style sheet. These features not only work in online outputs in browsers that support the CSS3 specification, but in PDF and XPS print outputs as well. MadCap has provided more than twenty design-ready templates you can use out-ofthe-box to produce online and print outputs for deliverables such as: brochures of all sizes, online knowledge bases, user manuals and more. This will be especially helpful for new Flare users who need a little extra help to get started, or for authors who do not have access to professional design resources. There is a new slideshow feature that creates a carousel on the online output page. You can add as many panels as you wish, and panels can include any HTML content. All slideshow content is removed from all print-based outputs. I have always been a fan of Flare, and I think that Flare V10 is a leap forward in terms of functionality and improved output for our customers and the users of our help systems. Responsive output and support for OpenType fonts are two excellent features that make this release a ‘must upgrade’ in my book. Paul Pehrson, Senior Member STC, owns DocGuy Training, a consulting company that provides consulting and training services for MadCap Flare. Paul is a certified MadCap Advanced Developer, and is a certified Flare Trainer. His day job is as a technical author and engagement manager for Crossfuze Solutions. He lives in Utah, USA with his wife and four kids.